Glistening under Krabi’s glorious sun are white sands and crystal azure waters that lull its honeymooners to a languid pace of life on the islands of southern Thailand. Engulfed by towering limestone cliffs and mighty mangrove forests, Krabi’s relaxed beaches are undoubtedly the nation’s finest. The boundless Andaman Sea is host to a number of alluring marine species, its waters teeming with scuba divers and snorkelers. This is a premier destination for water sports enthusiasts and outdoor adventurers. 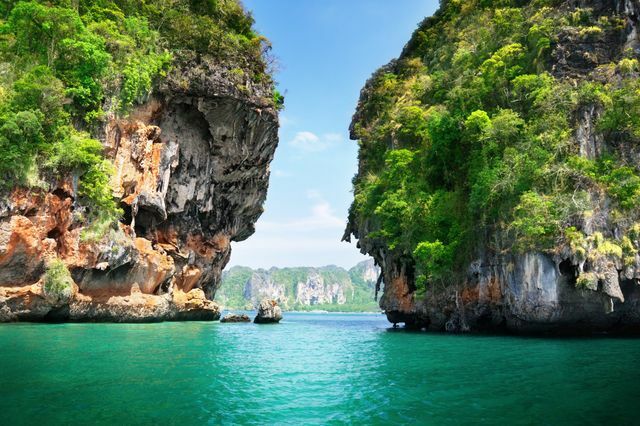 The epitome of a tropical paradise, Krabi will have honeymooners dreaming of its powder white sands and stunning karst islands long after their honeymoon. Krabi Province’s tropical climate renders it warm year round. The months of May through November generally mark the monsoon season with September and October being the wettest months of the year. Visit Krabi from November through March to escape the rains and unbearable humidity. Be aware that Christmas and New Years are the most popular time to tour Krabi, with hotels often fully booked. Railay Beach: Accessible solely by long tail boat, Railay Beach is an isolated oasis of calm, where beach goers bathe in the warm Andaman Sea. Tiger Cave Temple: Sacred golden Buddhas and a panoramic view of Krabi’s captivating karst topography reward those who conquer the notoriously strenuous journey to the summit of Tiger Cave Temple, which consists of over a thousand daunting steps. Phi Phi Islands: Race on a speedboat to the exotic islands that shot to stardom after its prominent role in the 2000 Hollywood movie, The Beach, featuring Leonardo DiCaprio. Khao Khanap Nam Mountains: Trek through the well marked trails of the dense jungle for an aerial view of Krabi’s surrounding islands. Krabi Sunset Cruise: Sail along the Andaman on a vintage junk boat and sip on cocktails as the warm golden hues of sunset descend upon the waters. Island Hop on a Private Boat: Explore the pristine beaches and impossibly turquoise waters of Koh Poda, Koh Tub, Koh Mor and Koh Gai islands on a long tail, speed or cruise boat in one relaxing day. Rock Climbing at Railay Beach: Scale the heights of Railay’s vertical limestone cliffs in this rock climbing mecca with a plethora of routes for climbers of all levels. Scuba Diving: Earn your scuba diving certification amongst Krabi’s soft coral reefs, leopard sharks and manta rays. Emerald Pool: Situated in Krabi’s national park, Thung Teao Forest Natural Park, a nature path through this tropical rainforest leads visitors to a warm and emerald coloured lake, fringed with exotic flora and fauna, and noted for the occasional sighting of the endangered Pitta Gurney bird. Klong Thom Hot Springs: A naturally occurring hot spring hidden in a rainforest, its water from deep within a volcanic chamber is rumoured to contain natural healing properties. Night Market: This lively weekend market in Krabi town offers an array of local bargains and assortment of delectable Thai street food. Cooking School: Learn to master your favourite local dishes and produce curries from scratch from some of Krabi’s most acclaimed home cooks.